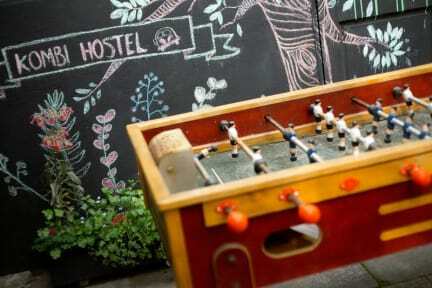 Great hostel!! Super nice and helpful staff, clean and large rooms, comfy beds and best of all a super fun bar in the backyard!! Best to stay here if you love te party, because of the bar and great location in the student area of town. I would absolutely recommend this hostel! I had the most wonderfull stay in Kombi Hostel! De hostel has the best facilities and the staff is so lovely. Kombi hostel feels like a warm family. Especially German, Nerea, Flavia & Clara really made my stay feel like home. I recommend this hostel to everyone who wants to have a good time, nice parties, yummie BBQ's and much love! Mi gusto!! Really nice hostel with good common areas. Easy to make friends. Only conplaints are that it's loud during the night and right now there are working on something during the day in the backyard. Hostel is in the club area! So if you like to party you are in the good spot! Music playing till late. The hostel is great. Good atmosfear. Great common area! The beds are terrible.. wrapped in plastic. You wake up sweating. Nice hostel in one of the better parts of Santiago. The hostel has a nice atmosphere and luckily the heating in the common area worked after my second day. Staff is helpfull and friendly. Especially Ronaldo creates a good atmosphere and makes the place feel like home. Would come here again when I visit Santiago.